Patients shouldn’t feel self-conscious about their smiles or wearing orthodontics to straighten teeth. That is why Anaheim Hills Smiles Studio provides Invisalign® clear braces for patients who wish to achieve their dental goals without being restricted by metal wires or brackets. Straight teeth improve appearance, as well as proper bite function and strength. To see if you qualify for clear braces, contact our Invisalign provider today for a consultation! 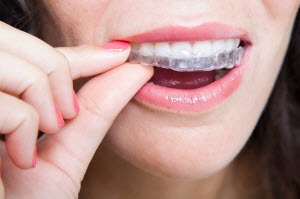 Many patients choose Invisalign clear braces at our Anaheim Hills dental office because they are the best way to enjoy discrete dental appliances. This is due to the high-quality, translucent material used to fabricate the trays, which allows teenagers and adults to attend social events without feeling self-conscious about their orthodontic treatment. Invisalign clear braces are also a preferred choice for individuals who are experiencing relapse from a previous teeth straightening method. Unlike traditional metal braces, the Invisalign orthodontic system does not place dietary restrictions on the wearer. Patients can enjoy their favorite foods and do not have to worry about damaging their appliances. Invisalign clear aligners are removable but must be worn 22 hours a day, so treatment remains effective. When it comes time for your daily oral hygiene routine, simply remove your trays and brush your teeth as you normally would. Once you have finished, rinse your aligners under lukewarm water and place them back in. Our goal is to make sure you receive all the benefits this alignment method has to offer. Dr. Adelynia has been an Invisalign certified provider for many years and can determine if Invisalign trays are right for you. The Invisalign orthodontic system is ideal for patients who have mild to moderate malocclusions. If you choose to continue with Invisalign, impressions will be taken of your smile and sent to the Invisalign lab where your trays are crafted. Invisalign then sends your appliances back to our Anaheim Hills dental office along with predicted progress reports of how your smile should look during different periods of treatment. Our dentist will check the fit of your aligners and schedule future appointments to monitor your progress. Call Our Anaheim Hills Practice! Dr. Adelynia utilizes the Invisalign orthodontic system to help patients achieve their ideal smiles. Our dental practice offers Invisalign clear braces for teenagers and adults who wish to straighten their teeth without the use of metal wires. For more information call us today!